Grantham Journal 29th April 1916, report of the wedding of Charles Gale and Mary Lee in Mansfield, 1916. Grantham Journal 28th May, 1921, report on the wedding of Charles Gale to Gladys Shepherd. Brother of Christopher and Cyril Gale, all three of whom served during WW1. Cyril tragically lost his life, but Charles and Christopher survived. Their father, Charles Cecil Augustine Gale, baptised on the 8th of October 1871 in Muston, was the son of Christopher and Jane Gale. In 1893, he married Isabel Pritchett, aged 17, in the Bingham district, and they had three sons. The oldest was Charles Cecil, born in 1895 at Muston. Christopher followed in 1896, and Cyril in 1898. They also brought up their nephew, Reginald Cecil Pritchett, who was born in 1887. In 1901, the family lived at Downfields Farm, Skerry Lane, Muston, where Charles Senior worked as a horseman. They still lived at Downfields in 1911, but by now seventeen year old Charles Jnr had left home and was employed as a wagoner living with his employer, William Catton, and his family in Normanton, Bottesford. It has not been possible to be entirely certain of Charles Gale’s military service, because none of the records examined for men named Charles Gale could be shown to be his. However, a comment in the Grantham Journal (8th February 1919) provides some clues: “Pte Charles Gale is only just recovering from rheumatic fever, but has now got back to a hospital in Blighty”. From this, we know his military rank, and that he was being treated in England in early 1919. This basis allows online records (Find My Past and Forces war Records) to be used to identify Pte Charles Gale, G/17779 Middlesex Regiment (battalion not stated), who enlisted on the 11th August 1915 and was discharged on the 22nd February 1919 from ‘Depot Middlesex’. He served overseas and was awarded the Victory Medal and British War Medal. He was also awarded a Silver War Badge, no. B157605 issued 5/5/19. The military rank matches the news report, and his date of discharge is also what you might expect. It may seem odd that a man living in Mansfield should have joined this regiment, but he may have bee posted there as part of an effort to restore a unit depleted by losses. 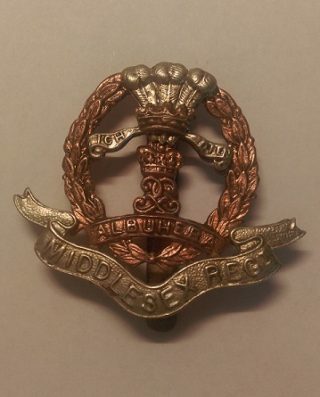 Another identification that has been considered is that of Driver 1080, 3/1st Battalion, Royal Horse & Field Artillery, who enlisted on 5/5/15 at Nottingham, and later given a new service number 608335. He was posted to 223rd Brigade Royal Field Artillery on the 8/7/16. In November 1916 he was sentenced to two years imprisonment for Striking his Superior Officer, Damaging Public Property and Drunkeness, but his sentence suspended on the 22/12/16, and in January 1917 he joined 232 Brigade. On the 18/5/18 his unexpired sentence remitted. On 20/7/18 he suffered a fractured leg (left tibia), and was sent back to England, receiving 45 days treatment before moving on the 20/2/19 to dispersal centre at Clipstone Camp. His next of kin was his wife (not named), 3 Crewe Terrace, Norton Street, New Radford, Nottingham. However, this seems unlikely to be the man from Muston. Charles Cecil Gale married Mary Lee, from Pleaseley, at Mansfield in 1916, as reported by the Grantham Journal on the 29th April. Sadly, Mary Gale died in Mansfield in 1920. Charles married for a second time in May 1921, in Muston Primitive Methodist Chapel, as reported by the Journal on the 28th May, 1921. His new bride was Gladys Shepherd of Pleasley Hill. The 1939 register records that at 30 Cardale Road, Mansfield, lived Charles C. Gale, born on the 29th May 1894, a colliery deputy, his wife Gladys, born on the 20th March, 1900, and their son Charles V. Gale, b.19th Sept 1929. Charles Cecil Gale died in Mansfield in 1979, aged 84.